And an entire page of Comments and Tributes from friends, fans and Forgotten Hits Readers. The book is doing great ... consistently a best seller on Amazon since it was first released ... and now Bobby's out doing a string of signings on his official book tour. 1395 Lexington Avenue at 92nd St. Discussion and song with Rolling Stone senior editor Anthony DeCurtis, followed by book signing. 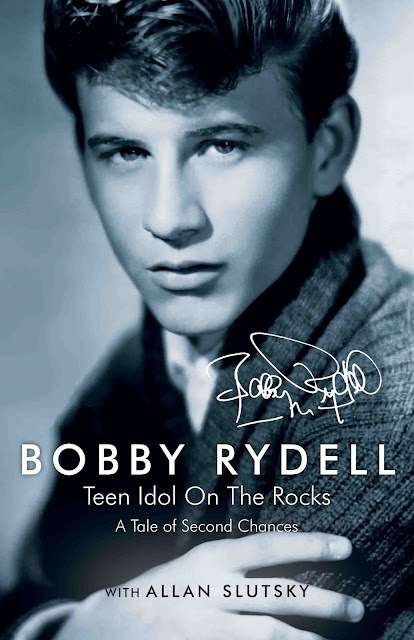 "Concert Conversation and Book Signing"
In this INTIMATE EVENING of musical performance, conversation and book signing, BOBBY RYDELL will not only perform his hit songs like "Volare," "Wild One," "Sway," "Wildwood Days," "Forget Him," "We Got Love" and others, but will also share stories from his incredible life. No More "Ode To Billie Joe"
But, after today ... we're gonna move this one to the back burner ... unless, of course, we happen to hear from Bobbie Gentry herself ... in which case we'll probably make headline news across the country!!! "Life" Magazine showed a full-page photo of long-haired Bobbie Gentry walking across the Tallahatchie Bridge, which figured in her song, "Ode to Billie Joe." And some of us did a double take. The location is Money, Mississippi -- a mile or two from where Emmett Till's body was found! Last year, there was a joke among black Americans. They knew what was thrown off that bridge. Jeez, got any other list hooks I can pen? People on the street have stopped to talk to me about tear jerkers! Wow, yer rockin' big guy! Here are a few of mine that if they don't get me misty eyed from time to time, they certainly give me the willies. • The End by Earl Grant -- This song definitely runs through my mind when I am saying goodbye for the last time to someone who's terminal. • Autumn of My Life by Bobby Goldsboro -- This song and Bobby's big hit, "Honey", makes a 40 or 50-something married person take a step back every now and then to think of the inevitable: what would happen when the time comes when you or your spouse are suddenly gone? • I forget the name of the song, but it is a narrated Glen Campbell track which speaks of life by the decades of your life (the 20's through the 70's). By the end of the song he pretty much says that you're on the back nine and that you wished it didn't go so fast. Another song that doesn't help with your mid-life crises. Maybe I missed it. My favorite tear jerker is White on White by Danny Williams. The thought of watching your first and only true love walk down the aisle with someone else, “holding back my tears, “til she’s gone away” always struck me as so sad. I was riding with my date one night when this song was a hit. After hearing it he looked at me and said "there is a lot of truth in that song". I was just a young guy and his words didn't mean anything at the time. My own son will be moving out soon and I can't listen to that song. If I have to play it as a request, I turn down the studio monitors so that I can tune it out. It is a very sad song for me now. The saddest Country song ever is George Jones classic 'He Stopped Loving Her Today'. True dat -- forgot all about the Ol' Possum's big country hit! When I first heard this song, I thought it was a nice little folk song by a Dylan wannabe but a DJ realized and passed along the poetic significance of the lyrics even though we had all heard the 'words' in the song. My all-time favorite DJ, Jerry G (WCFL listeners will remember him as Jerry G. Bishop), then of KYW / WKYC 1100 Cleveland, picked a backing instrumental and recited the lyrics as a poem to his listeners one evening in '65. Jerry G. was primarily responsible for my appreciating the lyrical content of rock / folk songs from that day on - even if I didn't like the arrangement or vocalist. Thanks and R.I.P., Jerry. Ah, but I may as well try and catch the wind"
Who can forget Denny Laine's vocals on this gem from the British Invasion? And I I don't even know my real name..."
This song by Tony Hicks of the Hollies involves a marriage breakup and how it effects the child. One that gets me nearly every time is Paul McCartney's tribute to his friend and former partner, "Here Today" from the "Tug Of War" album. I'll bet he had a hell of a time getting through that one. 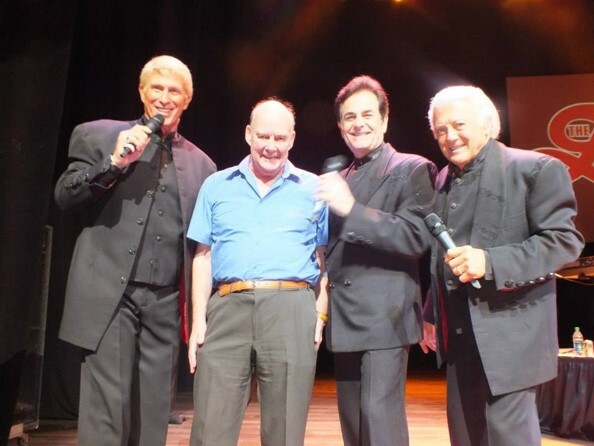 In 2014, after much saving up and with a LOT of help from fans in the US, I finally got to make the trip of a lifetime to see my idols (since I first heard them in 1961), the Lettermen. How I wish I could have made it earlier when the original trio were around, or when Gary and Donny Pike were with Tony Butala. However they STILL have that signature sound and in the 60’s or 70’s, bringing up our family of three kids, I could never have afforded it anyway. The tear-jerker came right at the end of the 3rd show and was the fabulous “I Believe”. As they sang the last few notes, I realized that I would (probably) never see them again ... and the tears flowed. Thank you so much Tony, Donovan and Bobby, and all the fans who were there for the greatest (entertainment) night of my life! Wow! I am so empathetic that just reading the titles and knowing the songs you are each speaking of makes me cry! I won't send my own list because I would just cry the day away. Add to that the songs that are linked to our own sadder memories and a rush of tear-relief ensues. OK, going off to listen to 'Monster Mash' or 'Itsy Bitsy Teeny Weeny Yellow Polka-Dot Bikini' or 'Beep Beep'. Gotta get me some silly songs. It's Forgotten Hits, The Kleenex Edition!!! 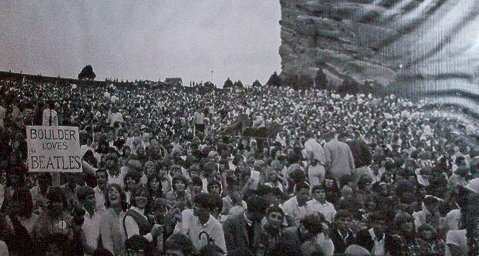 I sent this out to some friends and family who have been to this Denver "city park" legendary for it's beautiful scenery and historic concerts over 70 years. Some amazing youtube video at end from yesterday. In the second video listed at the bottom, see people at about exactly the spot above being pelted by hail at the pre-concert. 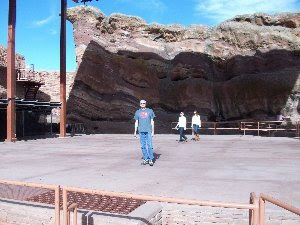 Last year, when on vacation to Colorado, Jill and I and brother Bill went to the famed Red Rocks theater near Denver. 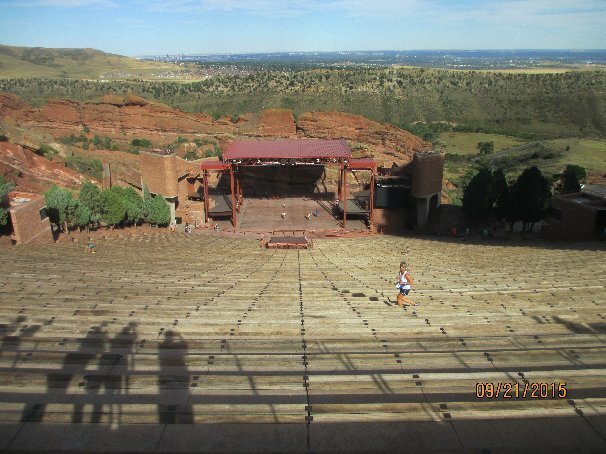 It was warm, but a beautiful place for a concert ... unless you get a terrible hail storm. Yesterday, before an expected event of Steely Dan and Stevie Winwood, it happened. We are tough out here and the show did go on even though it was late. 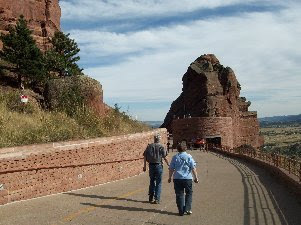 Troopers who love Red Rocks take thick plastic bags, blankets and tarps with them just in case. I guess half the audience stuck it out. About a year or two ago Barry Manilow cancelled after major lightening started striking. 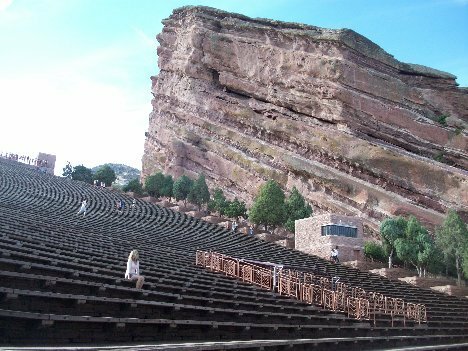 Red Rocks is acoustically perfect, but you take a chance with any outdoor theater. The Happy Together Tour has kicked off for 2016! This year the lineup features...The Turtles featuring Flo & Eddie, Chuck Negron formerly of Three Dog Night, Gary Puckett & The Union Gap, The Cowsills, Mark Lindsay former lead singer of Paul Revere & The Raiders, & Billy J Kramer. Due to unforeseen medical circumstances, Spencer Davis will be unable to appear for the June dates of the tour. 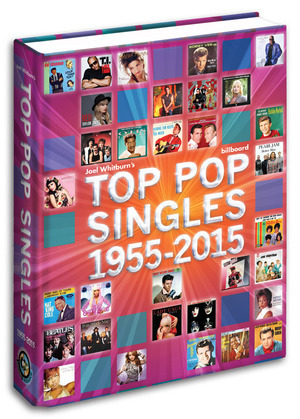 Joel Whitburn's latest edition of "Top Pop Singles" ... with all kinds of new features ... will start shipping in early July. Until then, you can save ten bucks off the cover price by preordering your copy now. This is the flagship book ... the industry bible ... and the one that started it all nearly fifty years ago ... a must have for any serious music fan, chart-a-holic or record collector. Moman was born in LaGrange, GA and moved to Memphis at the age of 16, going on to play in the road bands for Johnny Burnette and Gene Vincent. He later moved to Los Angeles where he became a session guitarist for Gold Star Studio. In the late-50's, Moman returned to Memphis where he began working with Jim Stewart and Estelle Axton at their Satellite label. When the company couldn't break into the country market, they changed their name to Stax and brought in R&B artists starting with Carla Thomas for whom he produced the company's first hit single, Gee Whiz. For the next five years, Moman produced most of the records coming out of Stax by artists like Rufus Thomas, the Mar-Keys, William Bell and Booker T. and the M.G. 's; however, after butting heads with Stewart over money, he left the label in 1964. Moman used money from a settlement with Stax to set up his own Memphis-based studio, American Sound Studios, where artists like the Box Tops and Joe Tex recorded. It was also during this time that Chips started to once again play guitar, working at the FAME Studio in Muscle Shoals and playing on recordings by Aretha Franklin. Moman and Dan Penn also began writing together turning out such hits as Franklin's Do Right Woman, Do Right Man and Dan Carr's Dark End of the Street. A dispute between Atlantic Record's Jerry Wexler and Rick Hall of FAME Studios brought the label's stable of artists to American Sound Studios where Moman produced music from Wilson Pickett, Dusty Springfield, Herbie Mann and many others. At one point in the late 60's almost a quarter of the Billboard Hot 100 was made at American Studios, many with Moman helming, and he branched out to work with other labels including Bang (Neil Diamond's Brother Love's Traveling Salvation Show) and RCA where he produced Elvis Presley's From Elvis to Memphis and Elvis Back to Memphis. By the mid-70's, Moman had tired of working in Memphis and moved to Nashville where he started working with a wide variety of country artists including B.J. Thomas, Willie Nelson, Merle Haggard, Tammy Wynette and Waylon Jennings for which he wrote the now standard, Luckenbach, Texas. He also produced the Highwaymen (Jennings, Nelson, Johnny Cash & Kris Kristofferson) and was often referred to as the fifth member of the band. The 80's found Moman back in Memphis but he soon took his studio to LaGrange, GA where he continued to produce for much of the rest of his life. Moman was, at one time, married to fellow songwriter Toni Wine who wrote such songs as A Groovy Kind of Love, Candida and Black Pearl. He is survived by his current wife, Jane, a daughter and a son. Henry McCullough, session guitarist and member of Paul McCartney & Wings during the 70's, has died at his home in Bellfast, Ireland. He was 72. McCullough had suffered a heart attack in 2012 from which he never recovered. His passing was confirmed by his wife Josie. I was very sad to hear that Henry McCullough, our great Wings guitarist, passed away today. He was a pleasure to work with, a super-talented musician with a lovely sense of humour. The solo he played on 'My Love' was a classic that he made up on the spot in front of a live orchestra. Our deepest sympathies from my family to his. McCullough was born in Portstewart, Northern Ireland where he played in local bands such as The Skyrockets and Gene and the Gents. After moving to Belfast in 1967, he joined the band The People who later became Eire Apparent. The band recorded one album, Sunrise, which was produced by Jimi Hendrix and released on Buddah in the U.K. In May 1968, he joined the folk group Sweeney's Men, bringing more of a progressive sound to the band but stayed for only two months before joining Joe Cocker's Grease Band with whom he played at Woodstock. After Cocker left to form Mad Dogs and Englishmen, McCullough and the Grease Band went on to record two more albums. It was also during this time that Henry shared electric guitar duties with Neil Hubbard on the original 1970 recording of Jesus Christ Superstar along with appearing on the Spooky Tooth album The Last Puff. In January 1972, Paul McCartney asked McCullough to join his band Wings who were just coming off their debut album, Wild Life. The set received only mediocre reviews and did not live up to the performance of McCartney's previous projects, going to only number 10 in the U.S. and 11 in the U.K.
By March, Wings was in the studio to record the tracks for Red Rose Speedway. Originally conceived as a double album, EMI insisted on cutting it to a single disc based on what they saw as substandard material and the lesser performance of Wild Life. The final album included the single My Love which became McCartney's second number 1 of his solo career. Anchored by the single, Red Rose Speedway went to number 1 in the U.S. and 5 in the U.K.
Also recorded during the Red Rose Speedway sessions with McCullough on guitar was the Live and Let Die theme which peaked at 2 in the U.S. and 9 in the U.K.
After the release of Red Rose Speedway, McCartney and Wings shot the critically drubbed special James Paul McCartney before embarking on a two month tour of the U.K. but, during the rehearsals prior to recording Band on the Run, both McCullough and Denny Sewell left Wings in a dispute over musical direction and the fact that Paul's wife, Linda, was part of the band. McCullough also said that McCartney was too domineering. In 1975, McCullough joined The Frankie Miller Band and recorded the album The Rock along with his own solo debut, Mind Your Own Business. He went on to play sessions with the likes of Roy Harper, Marianne Faithfull, Eric Burdon, Donovan and others. Over the balance of his career, he played in a variety of bands along with releasing three more solo albums in the 80's. And former Steam lead singer Gary DeCarlo's not doing so well right now either. (We've talked to Gary a few times before in Forgotten Hits). The voice of "Na Na Na Na Hey Hey (Kiss Him Goodbye)" is being treated for cancer in several parts of his body. A GoFundMe page has been launched to help ailing singer-songwriter Gary DeCarlo with his medical expenses. The voice and composer of Steam's late '60s classic "Na Na Na Na Hey Hey (Kiss Him Goodbye)" was recently diagnosed with cancer in several parts of his body, in addition to the bladder cancer he was being treated for. Money raised from the campaign will help pay for his medical care and assist his family. Sunday, DeCarlo posted on Facebook that he was "overwhelmed and very happy by the amount of prayers and well wishes that I've been given. I can't express how much this means to me. I feel very lucky to have friends and family that care that much about me. In this life, some people have one friend or no one. I feel truly blessed to have as many as I do. I will continue to write, record and do shows when they are available for as long as I am able to do so. Keep your eyes and ears open on June 21st for my video and CD. Together we'll keep on keepin' on." "A couple of years ago my memory just started going," Kris Kristofferson said in 2013. "They tell me it's from all the football and boxing and the concussions that I got." He has now been diagnosed as suffering from untreated Lyme Disease, publicist Tamara Saviano said on the Halli Casser-Jayne Show. The Daily Banner quotes a Columbia University Medical Center statement that Lyme Disease includes problems with short-term memory, name or word retrieval, and slower speed of thinking. Patients typically describe having "brain fog." always wanted me to play Scratchy and they couldn't wait to hear the short vocal part. It also reminds me of the Harlow Wilcox and the Oakies record 'Groovy Grubworm'. At least you could understand him saying 'I'm a grubworm'. Guys, here's the Scratchy segment first forwards and then backwards. As I listened years ago by turning the turntable in reverse with the 45, I reversed with a computer program and it sounds basically the same! Just mumbling! I just looked at the long list of your readers' favorite Summer songs. Isn't it amazing how just going through the titles puts a HUGE smile on your face? I can't remember if I submitted a few of my own favorites on the 2010 list or not (Damn those statin drugs! ), but I think almost all of them should be there. I have to say though, I like Bobby Vinton's '72 cover of "Sealed With a Kiss" better than the original. He's more emotional, and I LOVE the background bongo drums! Rick Springfield, Kenny Loggins, Kim Carnes, Ray Parker Junior and Kool and the Gang will perform on the first episode of ABC's summer music series Greatest Hits. The June 30th episode will focus on classic songs from 1980 to '85, including "Jessie's Girl," "Footloose," "Bette Davis Eyes," "Ghostbusters" and "Celebration." There will also be a special tribute to Michael Jackson performed by Jason Derulo. Aresnio Hall and country music star Kelsea Ballerini will host the Thursday night series, which runs through early August. If you're a fan of the songs of Jim Peterik ... who has written HUGE hits for The Ides Of March, Survivor, .38 Special and more ... you're going to want to check out his brand new show celebrating "The Songs" ... featuring brand new interpretations and arrangements of much of his best-known work. And we've got a chance for you to see him! The show is next Saturday Night ... June 25th ... at The Rau Center For Performing Arts in Crystal Lake ... at 8 pm ... and it should be something to see. Jim will be performing re-imagined arrangements of his hits "Eye Of The Tiger", "Vehicle", "Caught Up In You", "LA Goodbye, "High On Your", "The Search Is Over", "Hold On Loosely" and more. We've got a couple pair of tickets to give away that Jim personally set aside for us. Just drop us a line and we'll register you to win. Or come on out for a great night of music next Saturday night.